Images need to be transformed to optimal formats, resized and cropped for various aspect ratios, especially if you have a responsive site. In addition, you may want to apply special effects and overlays. Videos, too, need to be optimized for web delivery, transcoded to support different resolution options and streamed using adaptive streaming, as well as making other modifications. Then, when your media files are stored on the cloud, you’ll want fast delivery via content deliver networks (CDNs) to ensure a great user experience. 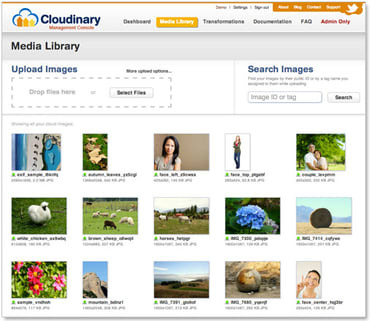 Can your users upload their own images to your web or mobile application? What about your content partners - do they upload their images directly to your service? We frequently hear complaints that as the service owner, you don't get enough visibility into the images uploaded to your service. In this blog post, we wanted to help you change that.